We’d love your help. Let us know what’s wrong with this preview of Damn Good Advice (For People with Talent!) by George Lois. Damn Good Advice (For People With Talent!) is a look into the mind of one of America's most legendary creative thinkers, George Lois. Offering indispensle lessons, practical advice, facts, anecdotes and inspiration, this book is a timeless creative bible for all those looking to succeed in life, business and creativity. These are key lessons derived from the incomparle lif Damn Good Advice (For People With Talent!) is a look into the mind of one of America's most legendary creative thinkers, George Lois. Offering indispensle lessons, practical advice, facts, anecdotes and inspiration, this book is a timeless creative bible for all those looking to succeed in life, business and creativity. These are key lessons derived from the incomparle life of 'Master Communicator' George Lois, the original Mad Man of Madison Avenue. Written and compiled by the man The Wall Street Journal called "prodigy, enfant terrible, founder of agencies, creator of legends," each step is borne from a passion to succeed and a disdain for the status quo. Organised into inspirational, bite-sized pointers, each page offers fresh insight into the sources of success, from identifying your heroes to identifying yourself. The ideas, images and illustrations presented in this book are fresh, witty and in-your-face. Whether it's communicating your point in nanosecond, creating an explosive portfolio or making your presence felt, no one is better placed than George Lois to teach you the process of creativity. To ask other readers questions about Damn Good Advice (For People with Talent! ), please sign up. Is it a good read for someone interested in digital marketing? Mansi Laus Laus Definitely! It will open your mind like an umbrella and give you the confidence to go the unconventional way. While it says (For People with Talent), it is mainly focused on the "traditional advertising" world. Nevertheless, the writer has a great sense of doing things the right way. This is a short book packed with awesome tid bits about creativity and marketing. I read it cover to cover. At times, the book was so spot on and insightful that I slammed it shut with anxiety. Holy cow, this is so good it's scary. Right after I was done reading it, I pulled out a notepad and began shooting out ideas. Knygoje reklamos specialistas George Lois dalinasi ne 1, o net 120 patarimų apie kūrybiškumą ir reklamą. Gerų minčių yra, bet iš esmės ypatingai nesužavėjo ir didelio įspūdžio nepaliko. Knyga turėtų būti aktuali visiems, kam įdomi reklamos sritis - dizaineriams, marketingistams ypatingai. This book is a great motivator. It boasts a clean, fun design, it's easy to read (in one sitting or spread out over a week where you really need a kick in the pants), and is straightforward. George knows what he knows and that's all there is to it. At first, I was thrown off by the numbered list format of the book-- I was expecting something more traditional-- but it was great. It made it very light and easily digestible. George's writing style is aggressive, in your face, and matter-of-fact-- s This book is a great motivator. It boasts a clean, fun design, it's easy to read (in one sitting or spread out over a week where you really need a kick in the pants), and is straightforward. George knows what he knows and that's all there is to it. Tai - labiau įkvepiančių motyvacinių frazių rinkinys, nei patarimai. Tuolab "velniškai geri". Tačiau suprantama, kodėl autorius knygą pavadinimo taip pasipūtėliškai. Visos knygos metu kartoja - pasitikėk savo idėja, rėžk drąsiai, varyk tiesiai. Taip pat beveik kiekvienas jo patarimų - pasigyrimas, kaip kažką padarė ir tai pavyko. Kas irgi, tebūnie, bent jau iš patirties kalba. Nežinia ar tinkamos kitiems, bet, bent patirties. Tai - labiau motyvuojanti knyga. Ji padės kelti klausimus, kas reklamoj Tai - labiau įkvepiančių motyvacinių frazių rinkinys, nei patarimai. Tuolab "velniškai geri". Tai - labiau motyvuojanti knyga. Ji padės kelti klausimus, kas reklamoje gerai, o kas eh. Bet rekomenduoti negalėčiau - ši knyga paprasčiausiai pernelyg tuščia... Jei ties kiekvienu punktu būtų po nuorodą, kur pasidomėti plačiau (pvz. kokie kiti žmonės tai sako, kur plačiau kas rašo, iš kur idėja gimė...), būtų naudinga. O dabar - tiesiogine prasme feisbuko įrašų vertės rinkinys. Збіса добра порада - смішна мотиваційна книжка з великою кількістю картинок і неймовірних сленгових слів минулого століття. Загалом залишила хороше враження і надихнула прибрати робочий стіл і ще раз подумати про якість того, що я роблю. Звісно, серед 120 порад були й такі, з якими я категорично не погоджувалась, наприклад - менше спати. Ну камон! Але переважно - це тонізуюча книжка - не ний, зберись, працюй важко, роби годні вєщі і не мовчи про це! I read this book while I was backpacking through Europe right after I finished 5 years of Architecture school. I was in a place where you realize you've been pushed into the real world and you barely know how to swim. You haven't figured anything out yet. This book gave me 'Damn Good Advice' that I still go through at times when no one else can say the right thing. It's fresh and in-your-face. I loved how clear and to the point his writing style is. No BS, just like talking to the author in his l I read this book while I was backpacking through Europe right after I finished 5 years of Architecture school. I was in a place where you realize you've been pushed into the real world and you barely know how to swim. You haven't figured anything out yet. Not so "damn good". Most of the advice is either thinly veiled career boasting or something you should already know if you've progressed beyond the first year of marketing or design school. The book reads like a giant run-on sentence of "do more and do better" without actually giving insight into how to do this other than to "try". I've read more creative insight in a dry textbook, which is very disappointing because George Lois is talented and accomplished in his career. There are many examples Not so "damn good". Most of the advice is either thinly veiled career boasting or something you should already know if you've progressed beyond the first year of marketing or design school. The book reads like a giant run-on sentence of "do more and do better" without actually giving insight into how to do this other than to "try". I've read more creative insight in a dry textbook, which is very disappointing because George Lois is talented and accomplished in his career. There are many examples of work shown, but it somehow fails to tie them into the text, they sit flat on the pages like a picture of a trophy, impressive but with no explanation of method. In a field so focussed on process and creativity, this book lacked detail into either. Damn ! A great book ! Damn Good Advice isn't exactly a guidebook to achieve advertising success like its author George Lois has - it's more like advice to shore up your general life fundamentals. In that regard this book definitely hit the mark for me, and its clean design made for enjoyable skimming. Lois definitely doesn't shy away from tooting his own horn, but based on his body of work, a bit of fanfare doesn't seem inappropriate. A fine addition to the shelf of a creative. Nu a fost chiar ceea ce mă așteptam, trebuie să recunosc. Însă am rămas cu un set de idei frumoase, mi-a plăcut formatul și grafica și nu am putut să mă gândesc cât de frumos ar fi fost cursul de ''Introducere în publicitate'' pe care l-am făcut în primul an de facultate, dacă ar fi avut mai multe astfel de sfaturi practice de la oameni din industrie și mai puține clasificări, tipologii și definiții. George Lois is an American art director, designer, and author. 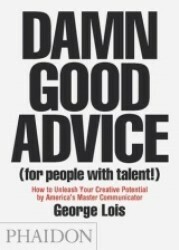 In Damn Good Advice , Lois offers a guide to creativity and success heavily influenced by his time spent working in advertising. While the book's advice heavily leans towards design work and advertising skills, there are pointers and advice that can benefit anyone working in a creative field. This book was pretty good, but I didn't enjoy it as much as I wanted to because I couldn't relate to it. It was more targeted for people that could use their creativity at work; artists, marketing, graphic design, etc. It talked mostly about advertising & how to stand out with your ideas through creativity. Como publicista, es una lectura obligada. Lois es un comunicador increíble, lleno buen gusto y sabiduría. Cualquier persona que trabaje con algo relacionado con la creatividad (en especial publicistas) debe leerlo. Este libro está lleno de buenos consejos irreverentes para mejorar el proceso creativo. I am a big fan of these books. I have been given this and 'It's not how good you are, it's how good you want to be' as gifts. Great quick reads for short journeys to inspire. I also like giving these books as gifts to fellow creatives and those in creative industries. A no BS examination of creativity and how to unleash/master it. Lois is gruff, perhaps even rude at times, but when he knows what has to be done, he gets it done. I'd work for him. I have a strange weakness: I'm attracted to the genre of "How To Be Creative" books. I don't know why -- they're all exactly the same, and they're all exactly useless. The book said it all! I first started reading this book sometime early/mid-2017 and couldn’t get past the 1st 30 pages for his “humor” and style of writing just didn’t appeal to me at all. I felt like in a way he was more of attacking the reader not advising them and I was repulsed by it. The words he used and the style was just so different from any book I have read before in this same category. Or maybe that was just my mindset at the time, but I put it back on my bookshelf and didn’t come near it again. Fast forwar I first started reading this book sometime early/mid-2017 and couldn’t get past the 1st 30 pages for his “humor” and style of writing just didn’t appeal to me at all. I felt like in a way he was more of attacking the reader not advising them and I was repulsed by it. The words he used and the style was just so different from any book I have read before in this same category. Or maybe that was just my mindset at the time, but I put it back on my bookshelf and didn’t come near it again. Fast forward to this week, I have decided to take on the entrepreneurial road and figured I need a good dose of motivation and also advice from books and people who have been down a similar road. So I went first to check my small book library to find any type of books that I can munch on until my more specialized books’ delivery gets here. And A Damn Good Advice was still sitting there among other books, I had to give it a try because, well, I like to think I’m talented and I sure as hell needed the advice. I picked the book and was going to start from where I last stopped, thinking I cannot really endure rereading those pages again, I got through them with a miracle! But then my other, enhanced, motivated version thought, well that’s exactly why I will start from the beginning. Now I’ll be reading with a different mindset and a different purpose. First time it was just another self help book, now I’m actually trying to learn something. I will learn something from this book whether or not I like the guy and his odd style. I started reading around 11 AM and I did not move until it was finished at around 3 PM (does that make me a slow reader?). To my surprise, at some point into the reading I started laughing at his humorous style, after a while I realized I was actually enjoying the read, instead of just going through it because i feel like I have to, I was looking forward to what will be on the next page, the advice and the jokes. And I realized his weird and “in-your-face” kind of way is just an acquired taste, one had to get used to it first to be able to appreciate it. Certainly a rich book, it is mainly focused on the advertisement business as he takes us on this ride of his career and his achievements, the people he met and collaborated with, but he pulls a lesson out of every one of those experiences that could very much apply to any other creative field. And some you can even apply to your own life regardless of your career or your field. The first time I saw this in my local store, my intuition lead me to believe this is some cheesy waste of time like the lot of pseudo-self-improvement books are. It was packaged thus I couldn't give it a personal value judgement. Amusingly enough, he advertised it well, I bought it the next time I went to the bookstore. I certainly did not expect it to be anywhere likely to "Tools of Titans", but I had a decent standard in mind. To be clear for others, the book is focused on visual design and adv The first time I saw this in my local store, my intuition lead me to believe this is some cheesy waste of time like the lot of pseudo-self-improvement books are. It was packaged thus I couldn't give it a personal value judgement. Amusingly enough, he advertised it well, I bought it the next time I went to the bookstore. I certainly did not expect it to be anywhere likely to "Tools of Titans", but I had a decent standard in mind. To be clear for others, the book is focused on visual design and advertising, though you can make an abstraction of his advice, they're strictly based on his experience and feel tasteless, taken with a grain of doubt (career experience alone gets old, intangible and valueless in a dynamic age). Consider that this has more of an aesthetic of a journal or an internet article, I could hardly call it a book. I work in a design (UI/UX) team myself, though not as a visual designer. Some advice here may spark you up for a short while, if you have a "great idea" (writing your first book for example), it may reinforce it, which is quite good, yet not enough to "unleash your creative potential". This book may hardly interest you if you're not fond of generalisations, old wiseless men trying to be actual, consumerist culture, and the usual american, superficial, self-centered pitiful pseudo-values or.. you're not a newbie 15 year old girl who's first found a mentor who sells visual design and advertising for creative development. I'm halfway through the book, swimming in a sea of cliches and truisms, spruced with a little bit of nonsense here and there, still trying to find the DAMN GOOD ADVICE, but the waves are strong. While I do not question the success of this guy's career, as this is the only thing he talks about, how awesome he is and how we can grow up to be just like him, he makes HIS experiences sound like some kind of recipe for success. Like any other successful person telling their stories and being full of t I'm halfway through the book, swimming in a sea of cliches and truisms, spruced with a little bit of nonsense here and there, still trying to find the DAMN GOOD ADVICE, but the waves are strong. While I do not question the success of this guy's career, as this is the only thing he talks about, how awesome he is and how we can grow up to be just like him, he makes HIS experiences sound like some kind of recipe for success. Like any other successful person telling their stories and being full of themselves, he fails to take into account the sheer amount of randomness in the Universe, the amount of luck that he had and the fact that he lived in another era of graphic design and advertising. Shades of the Tim Ferris type of a-hole, I am God, I am smart, if you don't do it like me, you're wrong. And stupid. I feel that the only thing that Lois does different from Ferris is that he is even more ostentatious! I'm no pansy, by any means, but he makes me puke a bit. Nobody likes a-holes. Do yourself a favor, do not pick up this book, unless you wanna hear this guy bragging about how amazing he is. There may be no time for that. P.S. : Advice no. 9 says "ALL creativity should communicate in a nanosecond". Then, advice no. 42 reads "To create great work, here's how you must spend your time: 1% Inspiration, 9% Perspiration and 90% Justification". I am definitely missing something here. Più che per i consigli, questo libretto merita una rapida lettura - oltre che per la bella galleria di pubblicità d'epoca che l'accompagna - per i gustosi aneddoti di vita vissuta coi quali Lois rafforza i concetti. Il culmine è il racconto di come avrebbe usato le tecniche del marketing per far riaprire il processo al pugile Rubin "Hurricane" Carter, inizialmente condannato per omicidio e poi riconosciuto innocente. Ciò detto, qualche idea interessante qua e là c'è. Tipo: secondo Lois, in campo Più che per i consigli, questo libretto merita una rapida lettura - oltre che per la bella galleria di pubblicità d'epoca che l'accompagna - per i gustosi aneddoti di vita vissuta coi quali Lois rafforza i concetti. Il culmine è il racconto di come avrebbe usato le tecniche del marketing per far riaprire il processo al pugile Rubin "Hurricane" Carter, inizialmente condannato per omicidio e poi riconosciuto innocente. Ciò detto, qualche idea interessante qua e là c'è. Tipo: secondo Lois, in campo creativo il gioco di squadra non è un vantaggio ma un handicap, e più i membri del team sono brillanti, più tenderanno a ostacolarsi tra loro. L'ho sempre pensato anch'io. This book was a quick read with loads of useful advice from a professional in his field. The reason I picked up this book is because I was researching books on creative directors and this was one of the must-reads . I didn't know who George Lois was (though I've definitely heard his name before) until I realized that he is the mastermind behind a lot of ads for famous brands and companies we see today, like Tommy Hilfiger and Aunt Jemima Syrup. The more I read the book, the more I noticed his st This book was a quick read with loads of useful advice from a professional in his field. The reason I picked up this book is because I was researching books on creative directors and this was one of the must-reads . The more I read the book, the more I noticed his strong ego, which didn't end up bothering me in the end since I realized that this man really knows his stuff. You can tell that he's had a lot of experience and has a strong sense of self which I find, you can mistaken for arrogance, when really, he's just trying to showcase what he's learned throughout the years. The tragedy of this book is that of a man who continually tells you to have the 'big idea' or go home actually sells you old rope. The book is what I'd consider quite 'American'. It's flashy, it's loud, it's PERFECT for advertising. But the man is so clearly a product of his time. He shuns teamwork - it's all about the (great) ego, which I suppose is his'. As I apparently don't know the man, I couldn't verify it, but he comes across as a massive douche. Now, not a lot in this book is factually wr The tragedy of this book is that of a man who continually tells you to have the 'big idea' or go home actually sells you old rope. The book is what I'd consider quite 'American'. It's flashy, it's loud, it's PERFECT for advertising. Now, not a lot in this book is factually wrong, there is a lot of sense in there, but you will have to get rid of the added bombast. There are valid points in here, but please take your time and your mind whether you want to be that kind of 'creative'. An no, not being out for a cheap, sensationalist, quick solution to everything does not make you 'mediocre'.